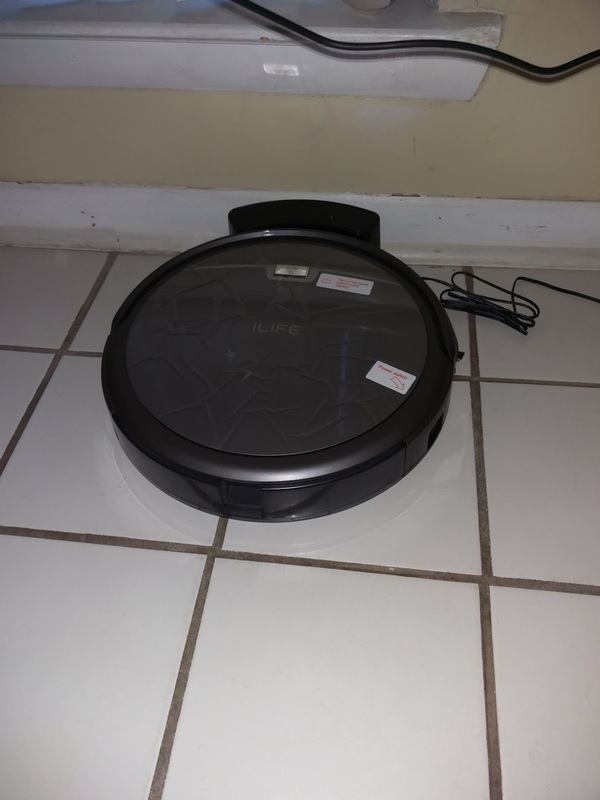 The iLife A4s is my first try at a robot vacuum. This little unit is a great equivalent to the Roomba. After using for a few days we've had great success with this little unit. Here are some of the high points. Pick up is great. On the first use we filled the hopper even picking up a charge cable and old receipt for a purchase. Battery life seems to be good so far running for over an hour at a time and still having battery life. Although it doesn't have WiFi or Smart connect, it does come with a remote that allows you to turn on and off without having to bend down and turn on. It has programming to preset when you want the unit to run. This unit is also considerably quiet and shouldn't disturb daily activities. Also comes with spare brushes and filters. The best part would have to be the price. This unit can be purchased on Amazon for $199. The only time it got stuck was running between 2 anti-fatigue mats between the stove and sink, it was tight area and the ledge was slightly over 1"
The other caution I would give - be sure to pick up any cables or small items that could get picked up as it may very well end up around the brush or wheels. At the end of the day if you are looking for a good robot vacuum that is well priced and does the job I would recommend trying the iLife A4s. The question becomes could this unit be used commercially. As many of my post deal with contract cleaners and commercial cleaning I have thought about this. One could use for this unit in a small office to reduce cost. I would consider this unit as a good spot vacuuming tool. It could be placed in an office and set to clean every night for a few hours picking up the small items. This would not eliminate the need for a full vacuum but for the nightly spot vacuuming could be a great option for a small office. Faculty managers: 3 things you need to do to prepare for cleaning automation in your facility. As a facilities manger, you understand the need to keep your facility clean but also to remain on budget, while working with your staff. As a veteran in the cleaning and maintenance industry for the last 20 years I have seen several major changes that impact the industry and people who run or work maintaining facilities. The robotics industry is the next major shift and I have found 2 articles that point to how close this shift is. The first article entitled Robotics RX by Dr. Steven Dalton found on cmmonline focus on the benefits of using robotics in health care. Since many facilities are facing an aging work force, shortage of labour, and rising cost of labour the robotics industry can help address many of those needs. Not to mention safety of employees when working around those who are sick, and needing to be their first line of defence. The article also points to the benefits of having access to more data which is an ever growing depend in this information age. 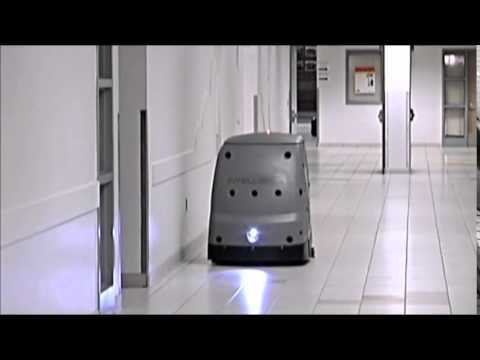 The second article entitled Clearpath: A Waterloo-Based Startup Is Making Waves in Robotics found in the globe and mail focus on a start up that has created robotic technology for delivery of goods. The article points to how this technology can by used in public areas and not interfere with pedestrians or moving traffic. It also points how the technology is being purchased and used by various other companies in manufacturing of other robotic devices. 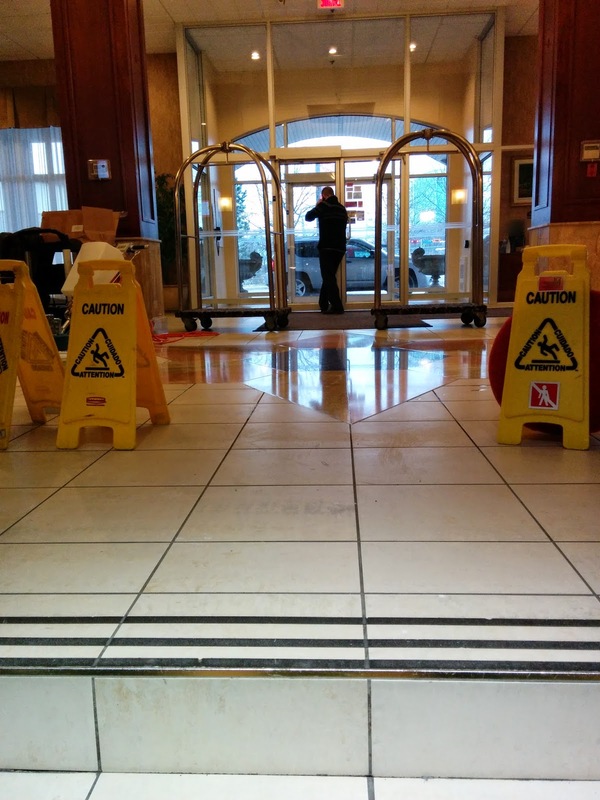 Based on the information in these articles and my experience in the industry I would have the following 3 recommendations you should seriously consider before purchasing any more equipment for cleaning and maintaining your facility. • Maintain your equipment. Robotic intelligent equipment is coming soon, maintain what you have instead of purchasing new so that you are ready for this new technology. • Train your staff. Robotic cleaning equipment doesn’t mean less staff it means different requirements for your staff. • Use technology. Weather you are a manger or employee the day is coming when technology will be a part of you’re everyday job, learn to use it now and be ready for tomorrow. Starting today you need to start training staff on technology, and not be afraid to incorporate technology in your cleaning and maintenance system. My name is Phil Tessier and I am currently taking the social IMC course from coursera, I am also a 20 year veteran in the cleaning and maintenance industry spending the last 6 years selling equient and supplies with Romco in Ottawa. Feel free to reach out to me and connect with me @zphilt1. Here's another interesting project we had. Granite is a nice product as it is one of the hardest natural stones available so a floor can last a long time with the proper care. This particular client had been waxing his floor for the last 15 years and placing matting in the winter. Stripping the floor proved interesting. 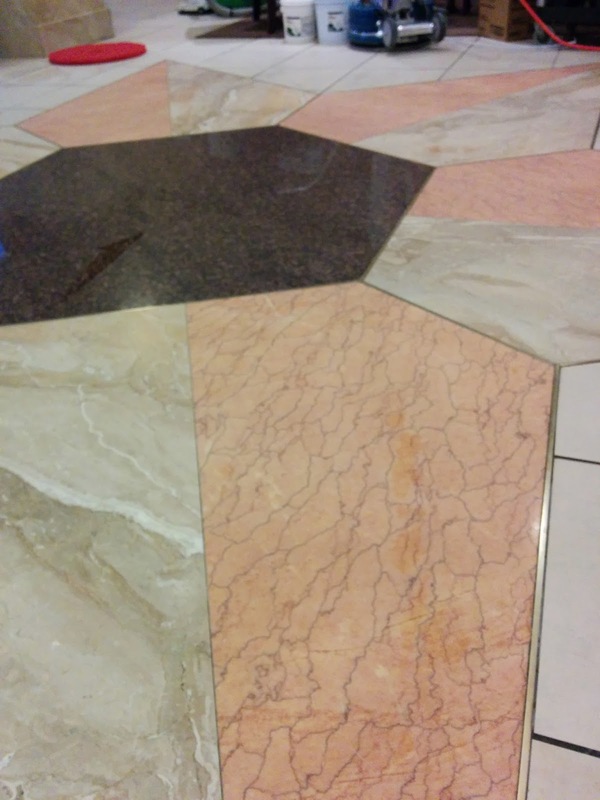 As the finish on a polished granite floor is hard and shiny floor finish will adhere to it but once stripper is introduced most of whats on the floor comes off with much ease. In fact for the amount of finish that was on the floor this was probably one of the easiest stripping jobs I have ever done. 1) we applied Time Out Plus floor stripper diluted at 1:10 and allowed it to sit for 10 minutes before stripping with a 3M high pro pad. 2) Rinse the floor well and allow to dry. 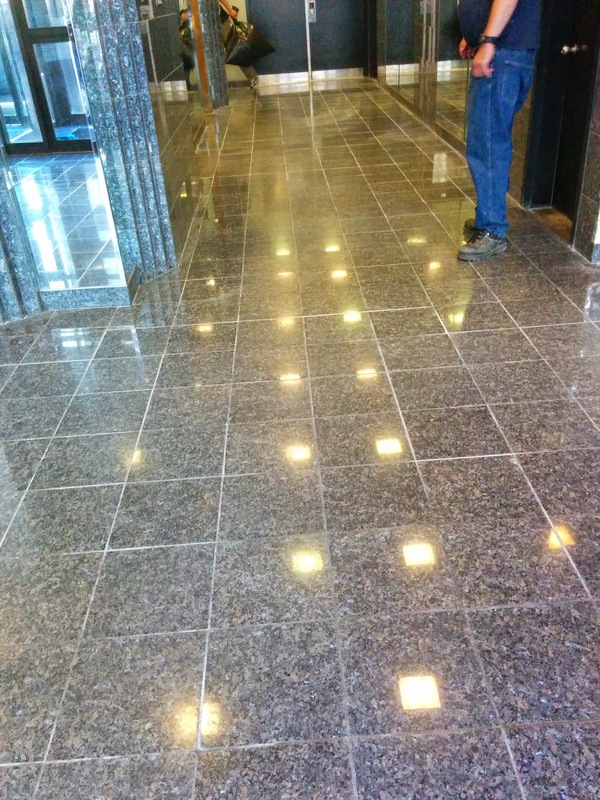 3) Using the weight floor buffer with full weight ( about 225lbs) and Ecolab Granite Polishing Cream slowly buff a section 10'X10' adding water to the cream to create a consistent slurry. 4) Wet vac slurry when finished. 5) Flood floor with clean water to remove all residue and wet vac it up. 6) Give a final rinse and allow to dry. 7) Buff floor with white pad to remove any remaining residue and admire. 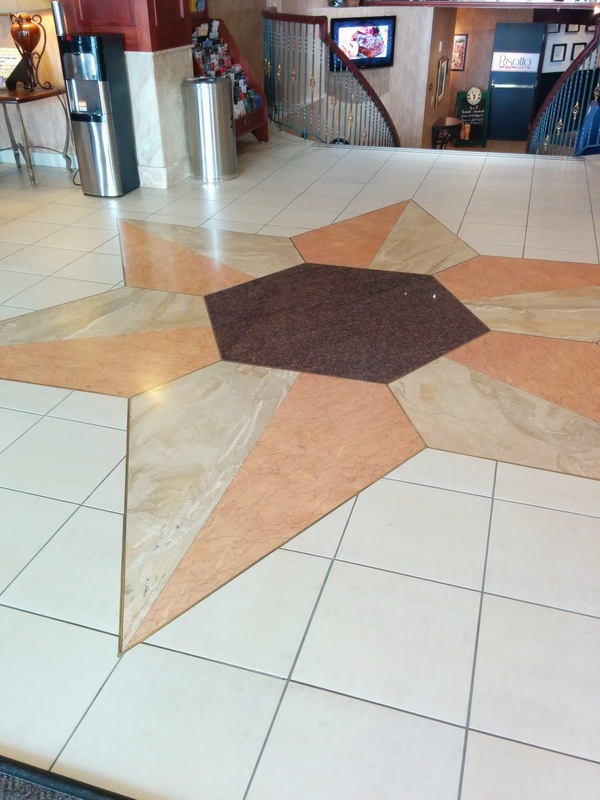 NOTE - If the floor does not have finish on it presently and you want to clean it up a little then you can alternatively use a tile and grout cleaner on the initial step. Also keep in mind that as granite is a natural stone the finished product will differ from location to location as well as under different lighting. Though this is the process we used and the final product was what we had hoped for I was recently sent this video from Ecolab which shows the process done slightly differently and appears to be just as effective. Enjoy. 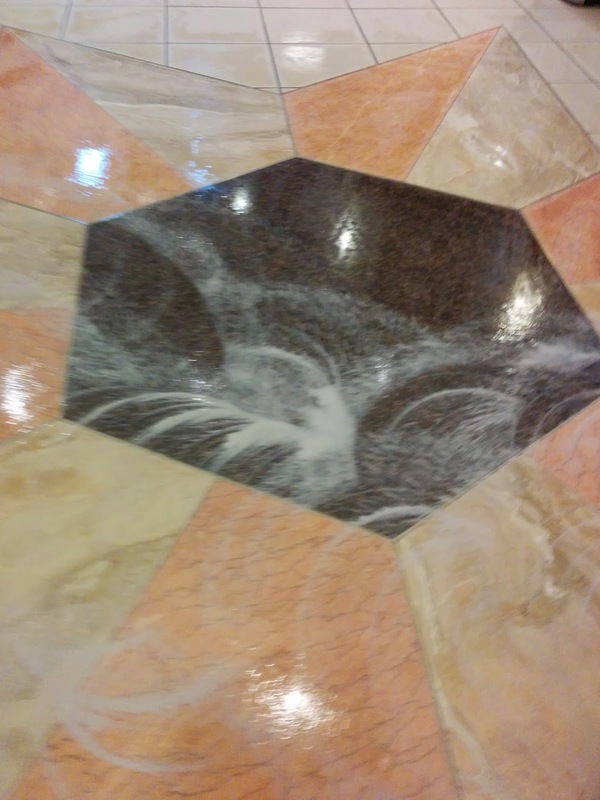 Recently I had the opportunity to polish marble in the lobby of a hotel. The program is fairly easy and the results are great. 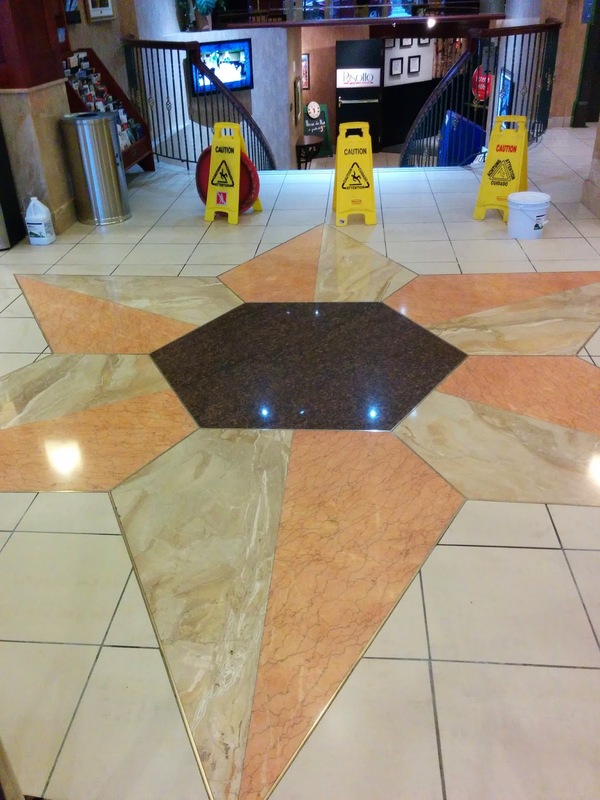 Client had waxed the floor and was looking for a better more permanent solution. Here is a quick step by step of what we did. 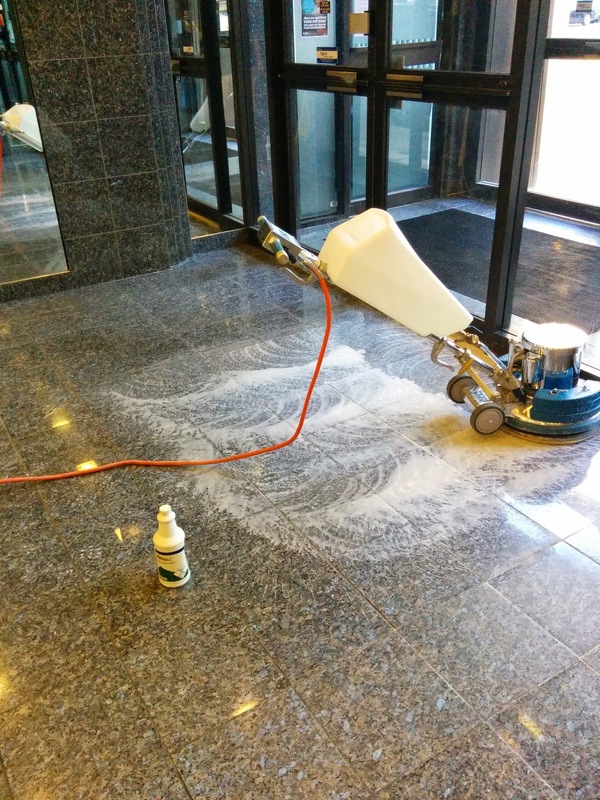 2) Using Mighty Max swing buffer ( Unit is a weighted buffer with over 75lbs of extra weight) we applied the Marble Prep 1 compound to the floor adding water as we went. 3) Vacuum slurry with wet dry vac and rinsed floor thoroughly. 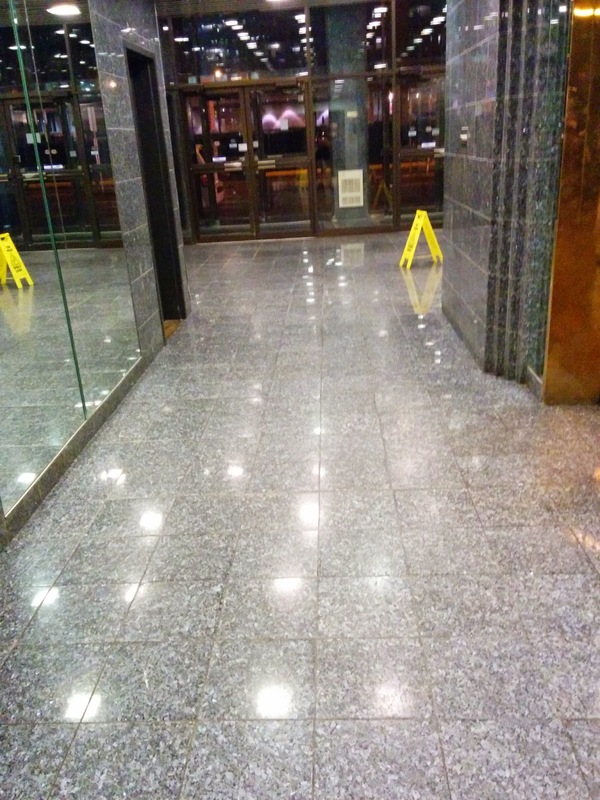 4) Again using Mighty Max buffer we applied the Marble Polish 2 compound to the floor. This is a wet product which add more water to. We work the product into the floor for about 30 mins. 5) Vacuum slurry with wet dry vac and rinsed floor thoroughly. 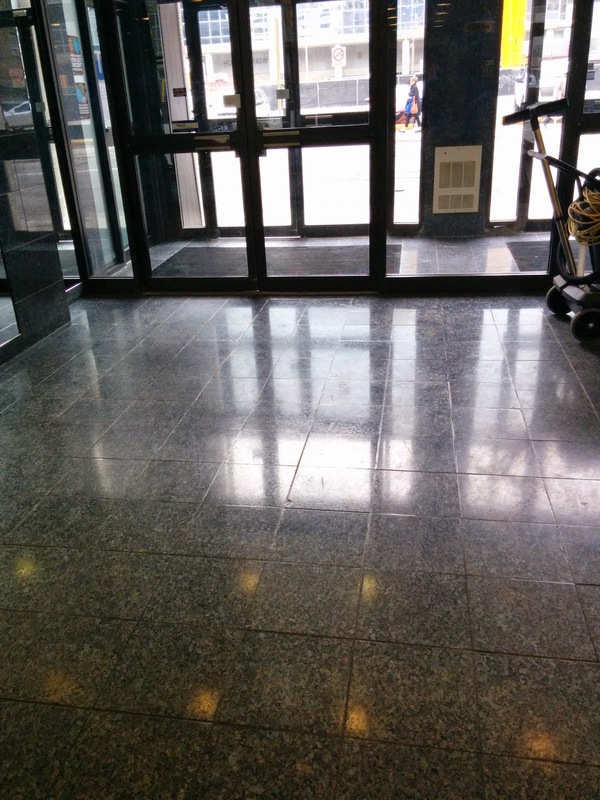 6) Buff floor with white pad to remove any residue left behind. 7) Admire the finished product. The final step is now maintenance. 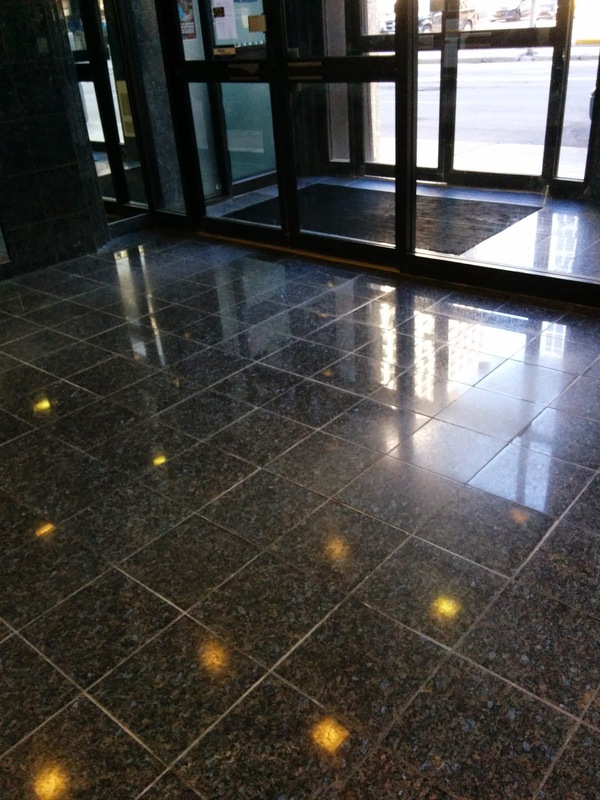 All the client has to do is on a monthly basis buff this floor with a 6000 grit diamond polishing pad and once a year using a little marble polish paste to shine the floor up.